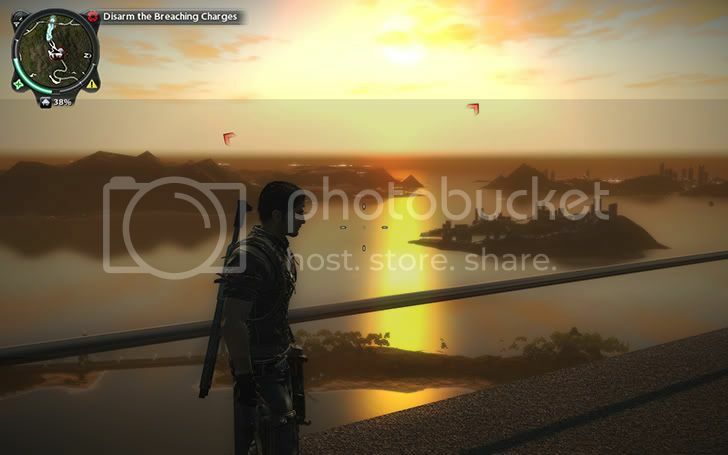 Just Cause 2 was recently released for the PC, including 2 new CUDA-specific effects. The first is GPU Water Simulation, which enhances the default water reflection and effects. The second is the bokeh filter, which is the focus of this article. You can learn the basics about this 15 year old photography technique here, along with its direct effect on your Just Cause 2 visuals. Check out the screenshots below to see where its actually used. Solid Tip: CUDA is an Nvidia product, enabled on most GeForce cards 8000 series and up. These effects are not available with Radeons. 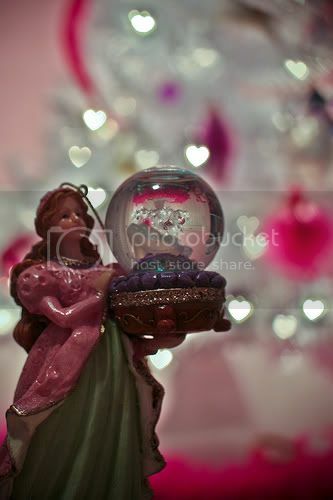 The word bokeh is taken from a Japanese word meaning blur or haze. In photography, it is a technique that deals with the look of the out-of-focus areas of a picture. Artistically speaking, the photographer wants both the foreground subject and the background to look good. Using a bokeh technique, the photographer gets more than just a plain blurry background. This usually centers around turning points of blurry light into pleasing shapes, as seen to the right. 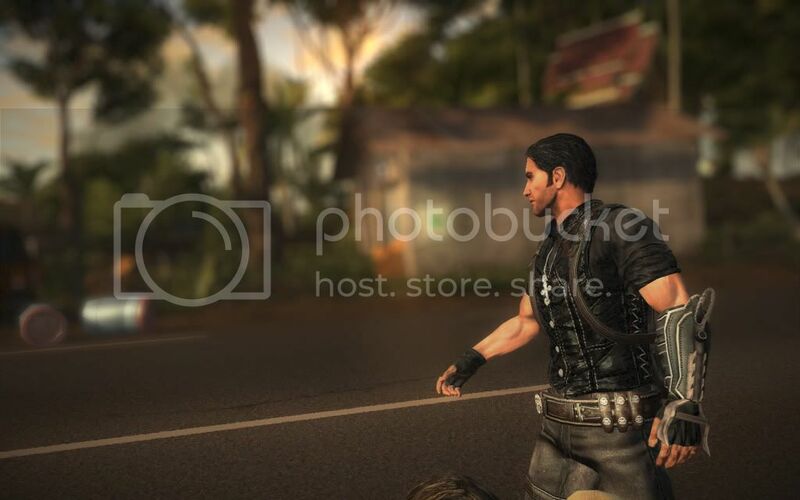 Just Cause 2 Bokeh Filter… Well, Where is it? If you have a CUDA enabled card with at least 256MB of video memory, you can select the bokeh filter and GPU water in the game’s options menu. The Wikipedia has a full list of CUDA supported cards if you are unsure about your card. We will be using a GTX 470 by EVGA in our tests. Click to view larger images. Our first comparison is from in-game screen captures. The first image has bokeh on and the second has it off. The first question you are going to ask yourself about bokeh is, what’s the difference? There is certainly none here. Okay, the tropical island and blue skies didn’t show us anything. How about a golden sunset overlooking the ocean? Strike two. Again, the two images look the same. If you look very closely, you can see a very subtle difference in the sunlight color on the water, but that’s it. Top image has bokeh ON, bottom is OFF. Why Would I Ever Use This Filter? After capturing a hundred screens in various locations, I discovered that Just Cause 2 uses the bokeh filter only in cut-scenes. It does produce a startling difference, as well. Notice that when the filter is OFF (the bottom screen), there is a bloom around the characters body. When the filter is ON, they no longer glow and appear in sharp focus against the bokeh background. That’s more like it. Conclusions: Bokeh Filter On or Off? The GPU Water does a much better job at showing off CUDA than this. Up until that cut-scene, we were all wondering where this filter was even used. It does not affect in-game visuals, and the cut-scene looks are a matter of taste. SolidlyStated has no recommendation on this one. During the game’s benchmark demos(which I ran before ever even playing the game), this effect was much more prevalent. It seemed, though, to be used incorrectly. Aesthetically, the bokeh filter is supposed to enhance points of light in the background. The benchmarks only include static landscape scenery, making the filter itself look as if it simply blurs distant objects. 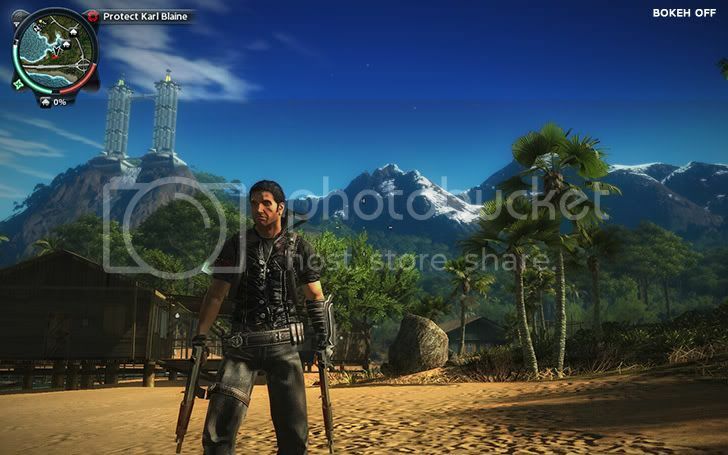 If you want to see some combined split-screen comparisons that show off the bokeh filtering, check out this supplemental article for the 3 benchmarks provided with the game. No matter whether you choose to turn it on or off, the graphics of Just Cause 2 (PC) are incredible and will look great regardless. It also makes the stuff in the distance EVEN BLURRIER THAN NORMAL when precision aiming with any weapon. If you’re doing this to zoom in a little to look at something far away, it makes it worse rather than better.